You know how stemware always flops around in the dishwasher and clatters and clinks and you know that, even if it doesn't break outright, it'll definitely wind up sideways, filled with a pool of dirty dishwater? And you have two choices: hope for the best and probably wind up re-rinsing the glasses, or scratch the whole dishwasher idea and wash them by hand. Well, not anymore. 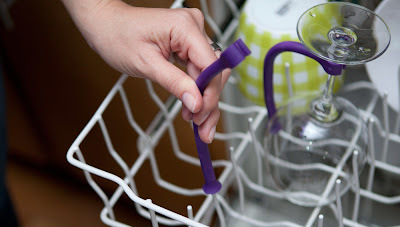 Enter Tether, a set of flexible plastic rods that attach to both the dishwasher and the stemware to stabilize your glasses. Frankly, they seem a little overpriced ($15 for a set of four), but I guess you can charge what you want when you're the only provider. And if they save you from broken glasses, they're probably a worthwhile investment.